Nowadays, many Laptops and Notebook Computers already comes with wireless connectivity(WiFi) so that you can easily connect with internet via Wireless Networks . As you already know, If you have a Wireless router in your home, you can make your own WiFi hospot for giving internet connectivity to all the Wireless devices such as Laptops, Palmtops and Mobile phones. But, have you ever thought that you can make Wireless Network without having Wireless Router? Therefore,today i will discuss how to make your own WiFi hotspot (Wireless Network) using a Laptop which having Wireless connectivity. Here, i am using a tiny application called Connectify. By using Connectify, you can turn the laptop into wireless access point even if you connect to the network with Local Area Connection (Wired connection). So, you can turn your wired internet connection to wireless. Get Connectify from below links. 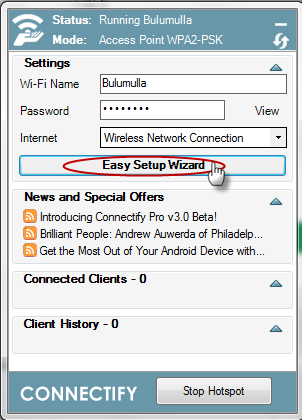 First, install connectify and configure it using Easy Setup Wizard. This configuration is very easy so i am not going to explain it. Now, you need to enable internet sharing on Network connection to share internet with new wireles access point. 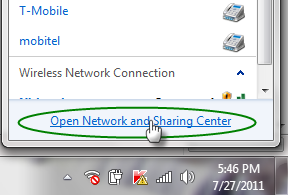 Go to the Control panel > Network and Sharing Center or Click on the Network icon located on the Taskbar then press open network and Sharing Center. Click on the Connection that you want to share (existing connection) See the figure below. In my case, i used Wireless connection but i also use Local Area Connection. It will open a connection status window, then click on Properties button and select the Sharing Tab. Put a tick on Allow other network users to connect through this computer's Internet connection. 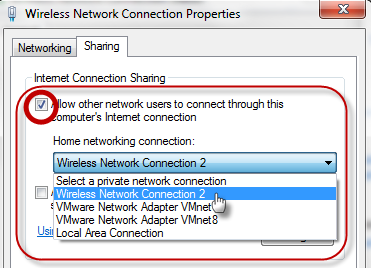 Select the new network connection (probably it is Wireless Network Connection 2), click OK button for finish. Now, your WiFi hotspot is successfully working, so search for WiFi networks using your WiFi Mobile phone or any other Wireless device. After that, you will find the new Wireless connection and you can browse internet from that device. When i was making this WiFi hotspot, i connected to this WiFi Network from my sony ericsson mobile phone. Below screenshot was taken while it is connected to my new WiFi Network. 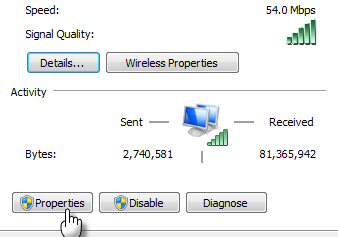 NOTE: If you use HSDPA modem or HSDPA phone to conncet to the internet, then please do not use Connectify. This is pretty cool, thanks for the info. I've been browsing online more than three hours today, yet I by no means discovered any interesting article like yours. It's beautiful value sufficient for me. This is a very well written article. I will make sure to bookmark it and return to read more of your useful information. I'm gone to convey my little brother, that he should also go to see this web site on regular basis to obtain updated from newest information. I'm gone to say to my little brother, that he should also pay a visit this weblog on regular basis to get updated from latest gossip. approximately your post on AOL? I need an expert in this house to unravel my problem. What's up to every one, the contents existing at this site are truly amazing for people experience, well, keep up the nice work fellows. reply back as I'm looking to create my own personal blog and would like to know where you got this from or just what the theme is called. Cheers! and wished to mention that I have really loved surfing around your blog posts.